Located in Conemaugh Township, Cambria County, PA. From US Route 219, take the St. Michael-Sidman Exit and proceed down Locust Street, PA Route 869 West, for about 210 mile to the "T". Turn left onto Rager's Hill Road (SR 3024, old PA Route 53) and travel for exactly 2 miles. At the intersection (Rager's Crossroads) at the top of the hill, make a right onto Clapboard Run Road (SR 3026). Travel for 1-1/10 mile. 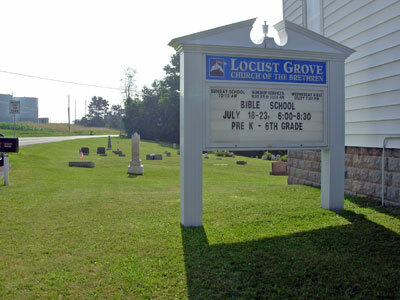 The church and cemetery is on the left side of the road.